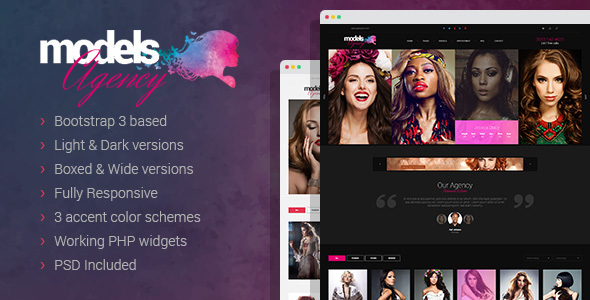 Models Agency is our new chic and sophisticated HTML template designed specifically for fashion or modelling agency but could be used as a personal modelling portfolio as well. This template has got everything you need to make an exquisite fashion statement. It comes with light and dark versions, as well as boxed and wide layout variations. Has 3 color schemes. You will not believe the amount of widgets and short codes that we stuffed this template with! We came up with a couple of options for headers, footers, as well as with breadcrumbs and copyrights, just choose what you like the most. The template features the events page so that you can always let your clients know what you are up to, and it also has an appointment page to make the booking process easier. That’s not to mention that this template is based on Twitter Bootstrap v3 and has a perfectly clean and valid code. This is going to be a perfect solution for your fashion business, so stop hesitating and just give a boost to your career by purchasing our template! Just in case you come up with any questions, know, that you can always contact out super-friendly support team and we’ll be happy to help! Hello ! i have a question about template. If i want to change the images of the icons of "service media" for another ones, where they are listed in the list of 4 or 5 items, how can i do that? Just replace the image with your image and that's it. Open the images folder and you can find all images that are used in this template. thansk for sharing! themes is beautifull.. image creative design..
saya dari indonesia.. sangat membantu..